Naples was in the throes of the ‘plague’. Every afternoon at five o’clock, after half an hour with the punching-ball and a hot shower in the gymnasium of the P.B.S. – Peninsular Base Section – Colonel Jack Hamilton and I would walk down in the direction of San Ferdinando, elbowing our way through the unruly mob which thronged Via Toledo from dawn until curfew time. We were clean, tidy and well fed, Jack and I, as we made our way through the midst of the dreadful Neapolitan mob – squalid, dirty, starving, ragged, jostled and insulted in all the languages and dialects of the world by troops of soldiers belonging to the armies of liberation, which were drawn from all the races of the earth. The distinction of being the first among all the peoples of Europe to be liberated had fallen to the people of Naples; and in celebration of the winning of so well-deserved a prize my poor beloved Neapolitans, after three years of hunger, epidemics and savage air attacks, had accepted gracefully and patriotically the longed-for and coveted honour of playing the part of a conquered people, of singing, clapping, jumping for joy amid the ruins of their houses, unfurling foreign flags which until the day before had been the emblems of their foes, and throwing flowers from their windows on to the heads of the conquerors. But in spite of the universal and genuine enthusiasm there was not a single man or woman in the whole of Naples who was conscious of having been defeated. I cannot say how this strange feeling had arisen in the people’s breasts. It was an undoubted fact that Italy, and hence also Naples, had lost the war. It is certainly much harder to lose a war than to win it. While everyone is good at winning a war, not all are capable of losing one. But the loss of a war does not in itself entitle a people to regard itself as conquered. In their ancient wisdom, enriched by the doleful experience of many hundreds of years, and in their sincere modesty, my poor beloved Neapolitans did not presume to regard themselves as a conquered people. In this they undoubtedly revealed a grave lack of tact. But could the Allies claim to liberate peoples and at the same time compel them to regard themselves as conquered? They must be either free or conquered. It would be unjust to blame the people of Naples if they regarded themselves as neither free nor conquered. As I walked beside Colonel Hamilton I felt incredibly ridiculous in my British uniform. The uniforms of the Italian Corps of Liberation were old British khaki uniforms, handed over by the British Command to Marshal Badoglio and – perhaps in an attempt to hide the bloodstains and bullet holes – dyed dark green, the colour of a lizard. They were, as a matter of fact, uniforms taken from the British soldiers who had fallen at El Alamein and Tobruk. In my tunic three holes made by machine-gun bullets were visible. My vest, shirt and underpants were stained with blood. Even my shoes had been taken from the body of a British soldier. The first time I had put them on I had felt something pricking the sole of my foot. I had thought at first that a tiny bone belonging to the dead man had remained stuck in the shoe. It was a nail. It would have been better, perhaps, if it really had been a bone from the dead man: it would have been much easier for me to remove it. It took me half an hour to find a pair of pliers and remove the nail. There was no gainsaying it: that stupid war had certainly ended well for us. It could not have ended better. Our amour propre as defeated soldiers was undamaged. Now we were fighting at the side of the Allies, trying to help them win their war after we had lost our own. Hence it was natural that we should be wearing the uniforms of the Allied soldiers whom we had killed. When I at last succeeded in removing the nail and putting on my shoe I found that the Company of which I was to assume command had been assembled for some time past on the barrack square. The barracks consisted of an ancient monastery, which had been reduced by time and the air bombardments to a state of ruin. It was situated in the vicinity of La Torretta, behind Mergellina. The ‘square’ was a cloistered courtyard, bounded on three sides by a portico, which rested on slender columns of grey tufa, and on the fourth by a high yellow wall, dotted with specks of green mould and great slabs of marble, on which were carved long lists of names, surmounted by great black crosses. During some cholera epidemic of centuries before the monastery had been used as a hospital, and the names referred to those who had died of the disease. On the wall was written in large black letters: Requiescant in pace. Colonel Palese nodded his head, and the sergeant shouted: “Company – ’shun!” The soldiers riveted their gaze upon me; it was sorrowful and intense, like the gaze of a dead cat. Their limbs became rigid and they sprang to attention. The hands that grasped their rifles were white and bloodless. The flabby skin hung from the tips of their fingers like a glove that is too big. Colonel Palese began to speak. “Here is your new commanding officer,” he said, and while he spoke I looked at those Italian soldiers with their uniforms that had been taken from British corpses, their bloodless hands, their pale lips and white eyes. Here and there on their chests, stomachs and legs were black spots of blood. Suddenly I realised to my horror that these soldiers were dead. They gave out a faint odour of musty cloth, rotten leather, and flesh that had been dried up by the sun. I looked at Colonel Palese, and he was dead too. The voice that proceeded from his lips was watery, cold, glutinous, like the horrible gurgling that issues from a dead man’s mouth if you rest your hand on his stomach. Colonel Palese came up close to me. “They understand,” he said in a low voice, and moved silently away. Under his left armpit was a black spot of blood which gradually spread over the material of his uniform. I watched that black spot of blood as it gradually spread, my eyes followed the old Italian colonel, with his uniform that had belonged to an Englishman now dead, I watched him slowly move away and heard the squeaking of his shoes, the shoes of a dead British soldier, and the name of Italy stank in my nostrils like a piece of rotten meat. From The Skin, in a new translation by David Moore, published by New York Review Classics. © Comunione Eredi Curzio Malaparte. Reproduced by kind permission. 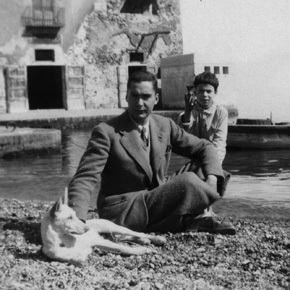 Curzio Malaparte (pseudonym of Kurt Eric Suckert, 1898–1957) was born in Prato and served in World War I. 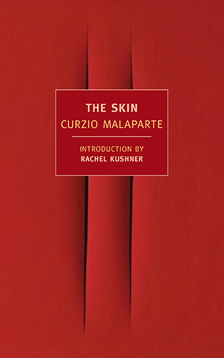 An early supporter of the Italian Fascist movement and a prolific journalist, Malaparte soon established himself as an outspoken public figure. In 1931 he incurred Mussolini’s displeasure by publishing a how-to manual entilted Technique of the Coup-d’Etat, which led to his arrest and a brief term in prison. During World War II Malaparte worked as a correspondent, for much of the time on the eastern front, and this experience provided the basis for his two most famous books, Kaputt (1944) and The Skin (1949). His political sympathies veered to the left after the war. He continued to write, while also involving himself in the theatre and cinema. 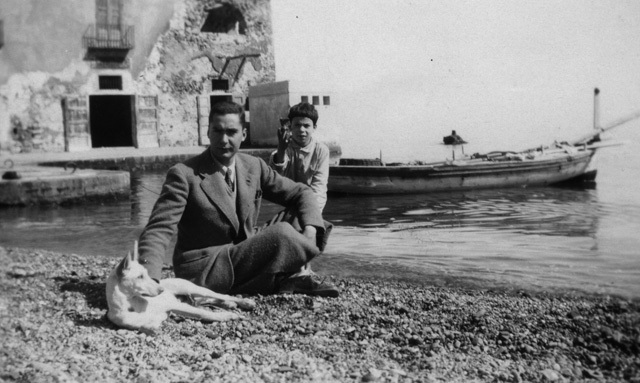 David Moore’s translations include Flora Volpini’s The Women of Florence, Dino Alfieri’s Dictators Face to Face, and Malaparte’s The Volga Rises in Europe.